Hobby Lobby is engaging in its yearly Independence Day charade, but the Freedom From Religion Foundation is here to expose it. Every Fourth of July, the pious folks at Hobby Lobby, the corporation that gutted Obamacare’s contraceptive mandate, run a full-page ad in newspapers across the country with one message: In God they trust. The ad shamelessly tries to sell the myth that the United States is founded on the Christian god by using quotes that are almost all deliberately altered or pulled out of context to change their meaning. Many of its usual ads pre-empted the patriotic holiday by running yesterday in Sunday newspapers. Thanks to generous, activist members in Peoria, Ill., and Eugene, Ore., FFRF is running a rebuttal advertisement this week. Ken and Cheryl Hofbauer arranged to make sure the facts play in Peoria, in its monthly Community Word. Charles Jones with the Portland, Ore., chapter underwrote much of a larger ad in the Eugene Register-Guard, running on July Fourth. 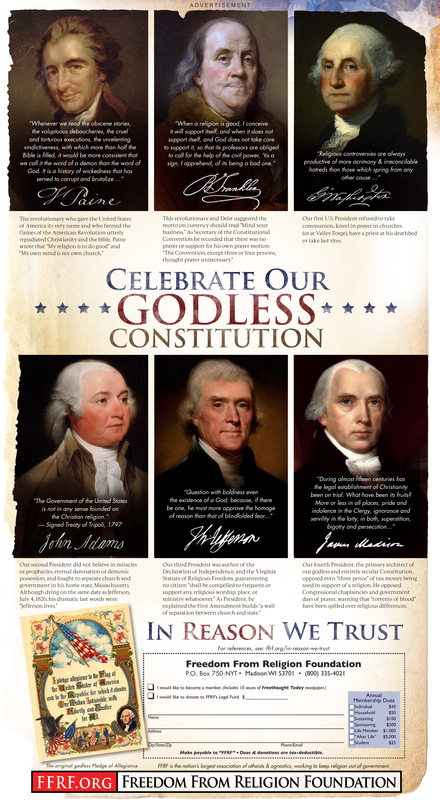 The ads draw on an advertising campaign by FFRF in 2013 running full-page ads in a number of dailies to counter the Hobby Lobby ad. “We thank these individuals and our chapter for their initiative and generosity. With member support, we hope to run a larger campaign in 2019 to counter the Hobby Lobby July Fourth ads, whose insidious purpose is to portray the United States as a theocracy,” says FFRF Co-President Annie Laurie Gaylor. Also in 2013, FFRF launched an interactive website showing all of the errors in Hobby Lobby’s ad that year. In 2016, an FFRF blog walked readers through Hobby Lobby’s deception step by step. Despite being made aware of these mistakes, Hobby Lobby continues to misconstrue these quotes year after year, sometimes adding new misleading quotes to boot. This year is no different. Every single one of the 16 misleading sources FFRF previously exposed remains in Hobby Lobby’s ad, without any correction or apology. “When readers take a look at the Hobby Lobby full-page ad, they should cross-check its claims against FFRF’s website — important when a notorious fundamentalist corporation promotes a version of history that is at odds with reality,” adds FFRF Director of Strategic Response Andrew L. Seidel.